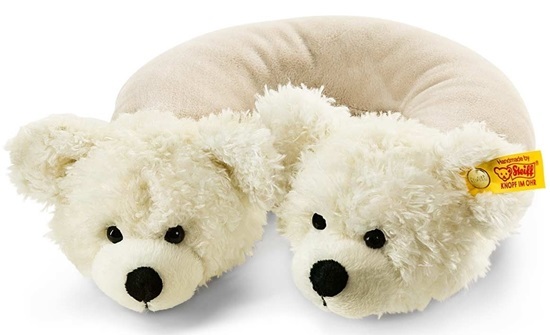 This soft plush neck pillow is perfect for the little traveler.. Heads will turn when your little traveler hits the road with this adorable neck travel pillow! Designed in 2015 by Steiff for their "Best for Kids" Collection, this is a beige and white pillow with Lotte heads on each end. The bear's head has black safety eyes and and black embroidered nose and mouth, on each one. This travel pillow is good for all ages and is machine washable.